The GE Personal Security Alarm Kit is an all out the box complete security alarm system for your home. 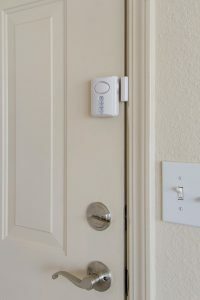 It integrates a doorway alarm system with a 4 digit keypad and it includes 3 independent sensors for your windows. Most importantly, there’s no circuitry or wiring needed for this to work so you can down tools for now! This system is good but missed a trick in the form of motion alerts via the 3G or wi-fi network. But that is reflected in the price. Wireless systems are hassle-free to set up and operate and they provide excellent security for your family as you can monitor them and receive alerts via the internet that get emailed to you. So if anything breaches the alarm system you can have an alert forwarded to your email. This can buzz you on your smartphone, so you will immediately know if your alarm has been triggered. Here’s an example of one here. But this system isn’t trying to compete in that market, which is reflected in the price, what it does have however is an ear shattering 120 DB alarm. The neighbors will no doubt hear that! So you can either mount the sensors and the keypad with screws if you are DIY savvy or use double sided tape. They require batteries, and there is a battery test switch plus a low battery warning indicator which kicks in once they are running low. There is a mounting plate on the back of the keypad so it would be best to screw this onto the wall. Well not bad for A DIY alarm kit- 1 screw is the least you can get away with! Once you hit the “AWAY” button on the keypad you have 45 seconds to exit the house before the alarm is armed. Upon returning you have 30 seconds to put the code in to disable the alarm. Switch it to “HOME” mode once you are in the house. The system will chime each time a doorway is open. Great if you have young kids and you want to know if they are sneaking out or you notice a door has opened when it shouldn’t have. So a cheap as chips system which is better than no system and it frees up your budget to purchase extra security items.